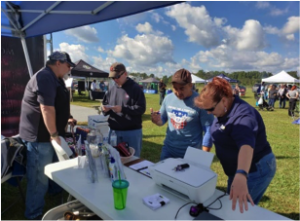 As in years past, Combat Wounded Coalition extended the invitation to organizations who provide veteran resources to participate in the CWC Veteran Resource Fair during Jumping for a Purpose. This year we had over 19 amazing organizations come out to provide all our guests with information, as well as direct assistance to those in need. One of these participating organizations was DAV Craddock Chapter 41. 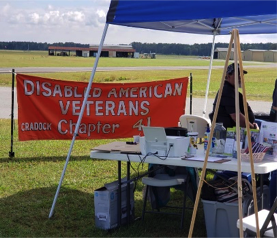 DAV Cradock Chapter 41 came out in force with six members, several of whom are Claim Service Officers. The Chapter brought with them all the necessary IT equipment to provide mobile VA claim processing while onsite at Jumping for a Purpose. We had several of our warriors take advantage of the opportunity to have these professionals relook at their current VA determination and refile an appeal to some previous decisions. ​We also had two other non-jumping guests sit down and begin a VA claim through DAV Chapter 41. CWC wants to give Chapter 41 a shout out for their creativity, flexibility and dedication to supporting all veterans struggling with health issues directly related to service of our country. To make an appointment or ask a claims-related question, please contact the Chapter at (757) 485-1248.